So you’ve adopted and/or rescued a European Starling. Well done! Your life is on a path of promising events and opportunities. In order to keep your bird happy (and alive), you’ll need to feed them a proper diet. 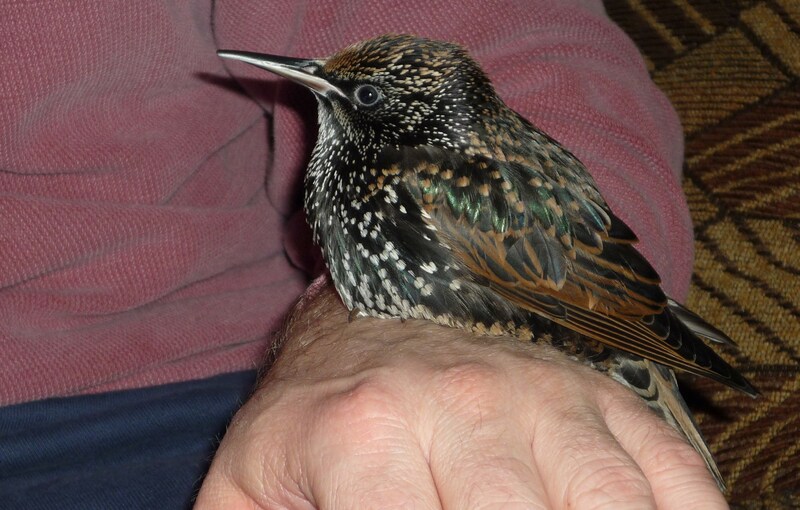 This page discusses how to prepare a healthy diet to feed to a pet adult European Starling. If your pet starling bird is younger than 6-10 weeks old or is not yet eating on their own, you’ll want to use the Baby/Fledgling Diet instead. Measure 2 cups of dry cat food with the right protein/fat ratios; Blue Buffalo Healthy Aging (Mature Cats 7+) meets the bill quite nicely. Grind it up into a fine powder using a grinder. Store-bought bird food is not adequate as it will not have enough protein and will frequently list corn (not chicken) as the first ingredient. 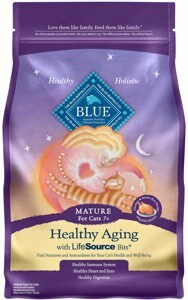 Blue Buffalo Healthy Aging is a good choice all the way around as it has 32% crude protein and 15% crude fat. It lists the first three ingredients as deboned chicken, chicken meal, and brown rice. Compare that to Harrison’s High Potency Super Fine bird food (which many vets will prescribe for high protein needs) which lists Millet, Barley, and Corn as the first ingredients as well as a lower crude protein of 20% and crude fat of 12%. Regardless of what you use, the first ingredient should always be chicken and it should have at least 33.1% crude protein and 12.1% crude fat for adult birds. 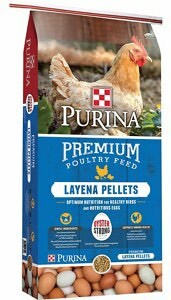 Next, measure 1/2 cup of poultry layer-mash/crumble (we used Purina Layena Pellets Premium Poultry Feed). Layer mash is a standardized vitamin/mineral formula for birds with high-calcium (i.e., egg-production) needs. Grind this up into a fine powder as well. Add these together to a storage container; this will be your primary food to feed to your little darling. Simply add to a small bowl. Make sure the mash/crumble is designed for egg-laying hens and is not medicated. After about three months of shelf life, you’ll want to replace this as the vitamins may not be as potent. If you’d rather not use poultry layer-mash crumble or are unable to find any at a local feed store, you can optionally grind up a single 750mg Tums Smooth Dissolve Tablet (one 750mg tablet) for the calcium and add some high-quality avian vitamins (I used Hari Prime). These two mixes make up the majority of your bird’s daily diet, as long as you add eggs and applesauce each day, in their own disk to prevent spoilage. Your bird will also need additional calcium. For the egg, simply hard boil it and rinse under cold water to easily remove the shell. Cut it up and add 1 tablespoon of the egg to a separate dish. One thing I’ve read about is that eggs should be boiled for at least 15 minutes to remove any bacteria that may be in the yolk, although I have nothing to back that up with. Alternatively, you can use whole egg powder (not egg substitute) if your bird won’t eat the eggs or if you want to minimize your preparation time. 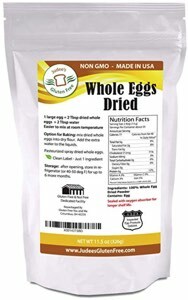 I use Judee’s Gluten Free Whole Dried Eggs ; simply add 2 tablespoons to the 2 cups cat food/half cup poultry mash mix (assuming 2 tablespoons equals one whole egg). I tend to alternate depending on whether or not I’ve boiled any eggs recently. In the same (or another) dish as the egg, add 1 tablespoon unsweetened applesauce. You’ll want to feed this daily and remove after an hour to prevent spoilage. I heat some up for about four seconds in a small bowl in the microwave each day, making sure that it isn’t too hot. The electric coffee grinder should be used for your bird food preparation only and not for coffee. If in doubt, label it “Birds Only” for safety. Any basic electric coffee grinder will do. You’ll want to keep it clean to prevent any spoiling of the oils that are left after grinding. If your bird won’t eat the dried mix, you can always add boiled water and let it cool. The disadvantage of this is that you can’t leave it out for more than an hour in order to prevent spoilage, and the rest must be refrigerated. If you want, you can use filtered water to reduce contaminants and plastic particles, although this may be overkill. Our bird seems to enjoy eating the dry mix without any issue. Probiotics have mixed reviews. Many people swear by them, however research also shows that it can tend to make things worse. We’re undecided on this issue and, since we haven’t noticed a difference in our bird’s poop, we tend to hold off using it. I use Avi-Culture 2 Plus. Occasionally you can add small amounts of different foods to broaden your bird’s palette. Avoid the common things that birds shouldn’t eat, such as salt, tomatoes, or chocolate. While many people like to feed their birds mealworms, keep in mind that this is the equivalent of feeding potato chips to a human; not very nutritious. The bottom line: Improper nutrition can drastically shorten the lifespan of a pet European Starling and, in some instances, cause metabolic failure (personal experience; we don’t recommend ever going through this experience). Much of this material was gathered from the StarlingTalk Adult Diet page and the amazing folks on the Starling Talk Message Board, without which we’d have been at a loss in raising our baby darlings. If you haven’t taken a look yet, it’s an amazing resource that every starling owner should have.